The Sacrament of Baptism formally joins a person to Jesus Christ and His people, the Church. Consequently, the family of a child to be baptized must be formally registered at St. Charles and attend Mass every weekend and holy day of obligation. If not attending regularly, parents should seriously consider the appropriateness of having their child baptized, and delay it until ready/able to make this commitment. 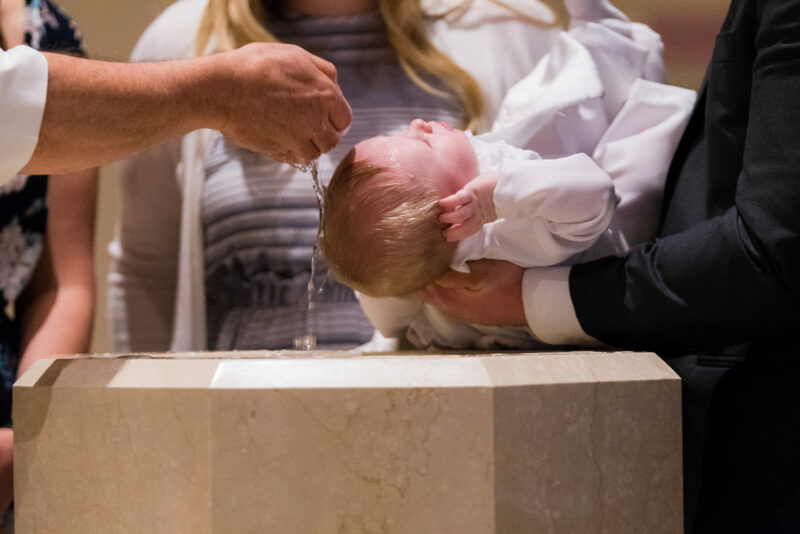 Since Baptism joins individuals to the Church, the baptism of children is celebrated here at St. Charles on the First and Third Sundays of each month at the 11:00 AM Mass. Baptisms are not celebrated at St. Charles during Lent. Parents, Godparents & the children to be baptized join in the Procession at the beginning of Mass, and then the children are formally presented to the community. One pew near the Baptismal Font is reserved for each family, including the Godparents. On the first Sunday, the actual baptism will be performed by one of our deacons after Mass; on the third Sunday, by the presiding priest celebrant during Mass. Because it is also an Easter Sacrament, joining us to the Risen Lord and making us sharers in His victory over sin and death, the baptism of adults takes place at the Easter Vigil celebration (the evening before Easter Sunday). For the baptism of a child, parents should call the Parish Center to make arrangements at least two months before the desired date for the celebration. Parents are required to attend a Baptism Preparation session at least one month before the baptism. The class is held on the Second Wednesday of each month at 8:00PM in the church. Failure to attend may result in a postponement of the baptism. Godparents should attend the class as well if they live locally. If they do not, they should attend a class at their local Church. Canon law also stipulates that Godparents must be at least 16 years of age and confirmed. Catholics who were not married in the Catholic Church are not permitted to act as Godparents unless they received an official dispensation to do so. Otherwise, such marriages must first be convalidated (“blessed”) by a priest or deacon, and any previous marriage officially annulled, before they can serve as Godparents. Prior to the baptism, Catholic Godparents must present a letter or certificate of eligibility from the parish at which they are registered. There is no charge for the administration of the Sacrament, but it is customary for each family to offer a donation, which helps to offset the cost of materials, maintenance and utilities. Envelopes are provided at the preparation class. If you have any questions or concerns regarding Baptism, please feel free to contact the Parish Office.